We are a young and talented couple with a commitment to sophisticated, relaxed cooking and great service at our Millburn Restaurant, Common Lot. 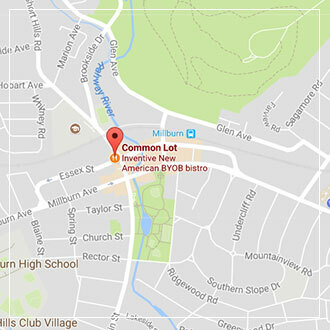 Common Lot is located on 27 Main Street Millburn, New Jersey, (at the corner of Main and Essex Streets). The closest public car parking lot is across the road from Common Lot, where the big clock is. We are a short 3 minute walk from Millburn Train Station from where you can catch a NJ Transit Train directly to / from New York Penn Station. The Train takes around 30 minutes. We are also a 5 minute walk from the renowned Paper Mill Playhouse. © 2019 Common Lot Restaurant. LLC All Rights Reserved.